Volunteers at a community hub which hosts local sports clubs, fitness classes and workshops for hundreds of people in Omagh say they'll be able to transform lives thanks to a £35,000 Asda Foundation donation. Colleen Heaney, the community champion at our Omagh store, helped Beragh Red Knights GAA secure the funding, which will pay for a new kitchen and improved flooring so the centre can host more groups. The centre is home to several Gaelic football and handball teams as well as a range of community groups. Colleen says it's important for bringing the community together and tackling isolation. She was joined by a number of colleagues from the store to present volunteers at the centre with their cheque. Colleen said: "Beragh Red Knights GAA is at the heart of our community, and I'm thrilled the Asda Foundation could support them with this significant donation. I look forward to seeing the new and improved facilities being put to good use for many years to come." 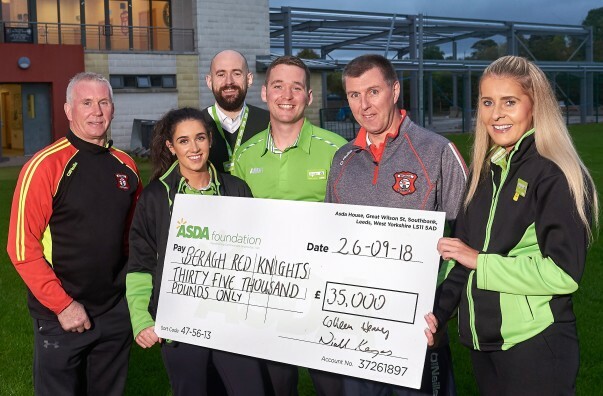 Gerard Treacy, vice chairman of Beragh Red Knights GAA, said: "We would like to say a big thank you to everyone at Asda Omagh for their support in securing the donation – it will help us to transform lives in the years ahead. "With over 250 adult members and 150 children training with our sports club on a regular basis, the new flooring for our main hall will allow our members to stay fit and active throughout the winter months. "The hall will also cater for a wide range of community events, including playing host to the local youth club every week. "By offering activities, classes, and workshops – along with a fitted-out kitchen – we are providing a space for both young and old to come together to socialise and exercise. This is vitally important to our community, as social isolation is a real issue for rural residents in the area."